It just so happened that the day I heard about the new Galvin Green base layers, the heating in our office building packed in. As if by fate, I read about these new thermals that would keep golfers warm whilst improving their performance on the course. I decided I have to try them out, so I got my hands on the new Galvin Green East top and Elroy leggings. On a typically cold November day in Edinburgh, I put them on and headed to the first tee. Like many golfers, I thought base layers were notoriously tight. Designed to hug your body, maintain circulation and blood flow but fit tightly enough to give you a better figure. 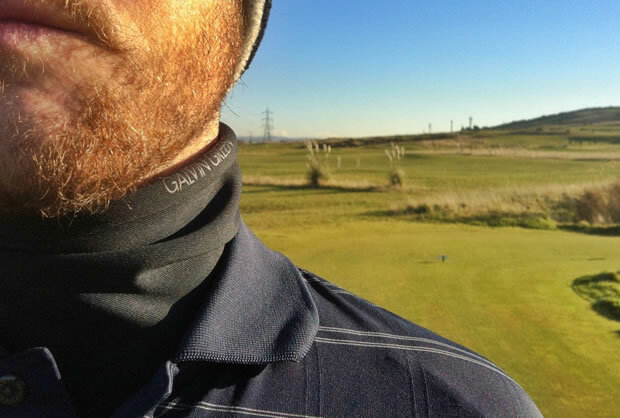 In the past, I thought base layers were universal and wearing a thermal top designed for running, football or rugby would be more than adequate for golf. However, that is not the case. These Galvin Green, golf-specific layers are different. When I put them on for the first time, I thought I may have been sized up wrong. The sleeves on the East top were comfortably loose on my forearms and I didn't look like a surfer trying to wriggle into a wetsuit for the morning surf. 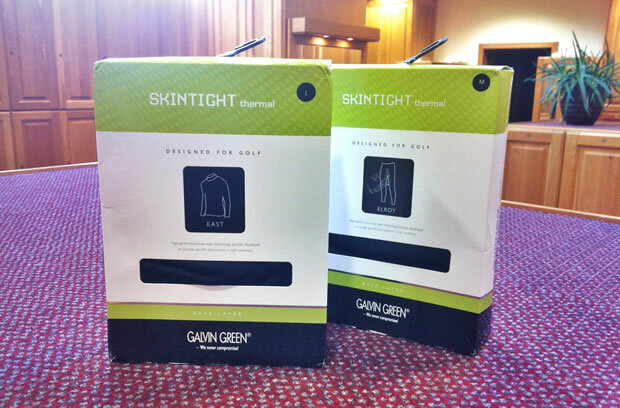 Truth is, that is how the Galvin Green golf-specific base layers are designed. Their primary focus on keeping you warm, but also being comfortable and fit in way that allows you to swing. Whilst I was initially surprised, I soon got a feel for what they were going for. Throughout the round, I felt warm and comfortable. 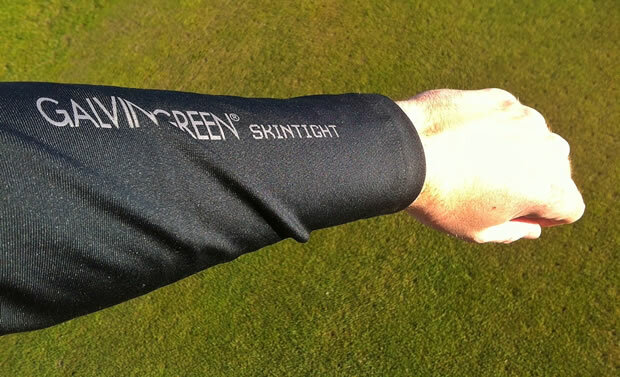 In the past, I have been ready to strip off base layers at the turn, but I never tired of the Galvin Green layers. The only thing I removed during the round was my jacket, due to the warmth I got from the layers. I could quickly see how important it is to get the right size. In the past, with other base layers, I have often picked the wrong size and either felt it was restricting or too big/long. I found other leggings would pull down under my trousers or I'd constantly be pulling at the tight neck of a top. Truth is the East top is far tighter than your average tee shirt or polo shirt, but not nearly as restricting as your standard base layer. Whilst it may feature "Skintight" branding on the packaging and product itself, I enjoyed that it wasn't as tight as other brands. The top features a large, tall neck design that can be folded over much like a polo neck top. I actually prefered to keep it up, having it fit comfortably under my jaw almost like a thin scarf or snood. Even when folded, it offers plenty of material/size to keep your neck warm. I find this is one of the key areas, along with your head and hands, that need to be kept warm throughout a round of golf. The leggings were, by design, a little tighter. They hug the entire length of your leg, specifically in the lower leg. The waist band was elasticated however, and didn't dig into my mid section. The leggings felt snug beneath a normal pair of golf trousers and throughout the round made a big difference in how I was able to conserve heat. Perhaps it was the design, and the fact that a golfers legs typically do a lot of work around a golf course, but from the 1st tee to the 18th green I was never worried about my lower half being cold. I never really considered needed a golf-specific set of base layers, but after wearing these Galvin Green layers for a couple of rounds, I changed my mind. I want to be warm but not restricted when I play, and the East top and Elroy leggings offered that performance. At £55 these may seem pricey, but in my mind they are probably worth it. You will certainly a great deal of use out of them over the winter and the quality that comes with any Galvin Green product means they will last. To check them out or get yourself one of the layers, visit Galvin Green's store locator and find a retailer near where you are.